4 yr./ 60,000 mi. 3 yr./ 36,000 mi. Full-size SUVs provide tons of room for passengers and/or cargo, and the best ones also provide strong performance and outstanding comfort. Two market leaders are the 2018 INFINITI QX80 and the 2018 Chevrolet Tahoe. These versatile vehicles seat at least eight occupants in comfort, and are available in all-wheel-drive versions. INFINITI QX80 received a serious update for 2018, with a redesigned exterior and upgraded interior. We invite you to drive both models – we’re confident you’ll prefer the INFINITI QX80 due to its superior performance, luxury and features. If you compare the standard engines of the two vehicles, you find that the INFINITI offers more power and torque. The QX80’s 5.6-liter, 32-valve V8 outputs 400 horsepower and 413 lb-ft of torque, mated to automatic 7-speed adaptive transmission with manual mode and downshift rev matching. Tahoe is equipped with a 5.3-liter, 16-valve V8 that puts out 355 horsepower and 383 lb-ft. It is paired to an 8-speed automatic. The QX80 has a larger towing capacity and maximum GVWR. 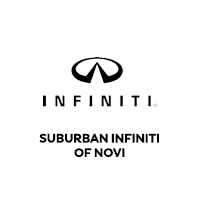 Both vehicles are body-on-frame SUVs, but the INFINITI is engineered to provide a superior driving experience. The interior is library quiet, with engine noises almost completely suppressed. Hydraulic Body Motion Control controls body lean without compromising ride via active shock absorbers. The Around View 360-degree camera makes parking easy. Distance Control Assist will slow or stop the vehicle if it comes too close to the car in front. Tahoe is also quiet, but it rides on a solid-axle rear suspension that benefits from magnetic ride control. Nonetheless, Tahoe delivers a less smooth ride compared to QX80. INFINITI QX80 provides standard features that are either optional or not available on even the top-trim Tahoe Premier. These include express open/close sunroof activation, LED low/high beam, LED fog lights, LED brake lights, passenger auto-dimming mirror, cabin plasmacluster air filter, voice-activated air conditioning, rear window express up, fold-flat front passenger seat, rear armrest, rear-seat audio controls, radio data system, 13 speakers (vs 10 in the Tahoe), door curb/courtesy lights, illuminated glove box, and height-adjustable rear seatbelts. The INFINITI also provides better warranties and a better roadside assistance program. We invite you to visit our INFINITI dealership and test drive the revamped 2018 QX80. We offer excellent customer service that prioritizes your satisfaction, so stop by today!